Liverpool will thrive on being written off following Luis Suarez’s departure, according to Brendan Rodgers. Liverpool boss Brendan Rodgers has praised his side for the manner with which they have responded to Suarez’s exit in Sunday’s 2-1 home defeat of Southampton. The Uruguayan striker, alone accounted for 31 of Liverpool’s 101 league goals last season, but was moved on to Barcelona in a £75m deal in the close season; causing much of the pre-game build-up to ponder greatly on his absence at Anfield. 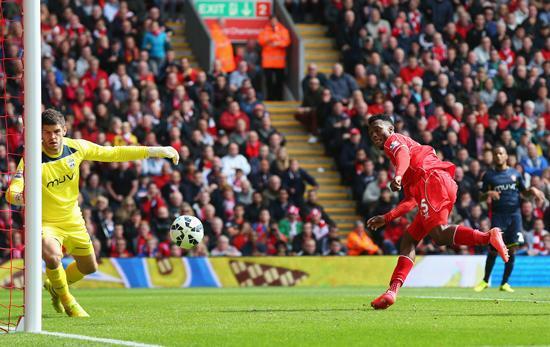 Daniel Sturridge Scores Liverpool’s Winner on the Opening Day of the 2014/15 Premier League Season. Getty Image. But Raheem Sterling and Sturridge answered all necessary questions, even after Nathaniel Clyne’s equaliser stretched the hosts’ luck far enough. “Our ambitions here at Liverpool have to be bigger than one player,” Rodgers said. “Luis sent us a lovely text (message) this morning wishing us all the best, which was a great gesture. He is a friend now of Liverpool. He’s a great boy, but he is gone now. “We are bigger than any player. We do still want another striker, but that will depend on the availability. It was all about winning against Southampton and we got there. As much as the good football we play, it was about grinding it out so I am really happy with that determination and character. Liverpool’s display against a team, from whom they acquired three of the best Premier League talents in the close season- Rickie Lambert, Adam Lallana and Dejan Lovren- and also lost their manager, Maurico Porchettino, signifies the Merseysiders will need improve on several aspects of their game if they are to repeat or better their second-place finish last season. A new look ‘Saints’, under Dutchman Ronald Koeman, displayed some outstanding attacking prowess for a long period and should have earned a deserved point when Morgan Schneiderlin’s shot came off the woodwork in a late rally. The Northern Irish manager added: “We believe in the way we work. I don’t think anyone is giving us any hope of getting in the top four, but that was the expectancy last season as well.